Emmanuel Adebayor has been rightly castigated this week following his inflammatory goal celebration at Eastlands on Saturday. The Togolese forward headed home Shaun Wright-Phillips's cross to all but seal victory against his former side, Arsenal, and then ran the length of the field to perform a knee-slide in front of the away section, sparking grown men into apolpexy and even prompting some to throw the remains of their over-priced hot dogs in the general direction of the man they once idolised. Adebayor's actions have been labelled 'senseless' and 'unsavoury' by Gunners fans, but should they be so quick to throw the first stone? 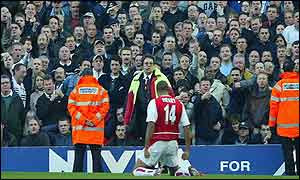 Cast your minds back to November 2002, and a 3-0 win for Arsenal over North London rivals Tottenham at Highbury. The match was best remembered for a fantastic solo effort by Thierry Henry - the Frenchman collecting the ball midway inside his own half before waltzing through a heavy-legged Spurs rearguard and planting the ball past Kasey Keller for what is - and it pains me to say - still one of the finest Premier League goals. However, Henry decides celebrating at the North Bank will not suffice and sprints down the touchline, past the dugouts and performs a near-identical display of provocation just yards from the travelling Spurs fans. Was Henry banned? Did the Arsenal fans tut in disapproval? Were hot snacks hurled onto the turf? Negative to all of the above, despite the similarity of the two incidents. How quickly, and conveniently, some people forget.